Not to be too much of a Mrs Elton, but Paul says this is quite the best ham he's ever had and I have to agree. The recipe is adapted from Clare Connery's wonderful book, In an Irish Country Kitchen. 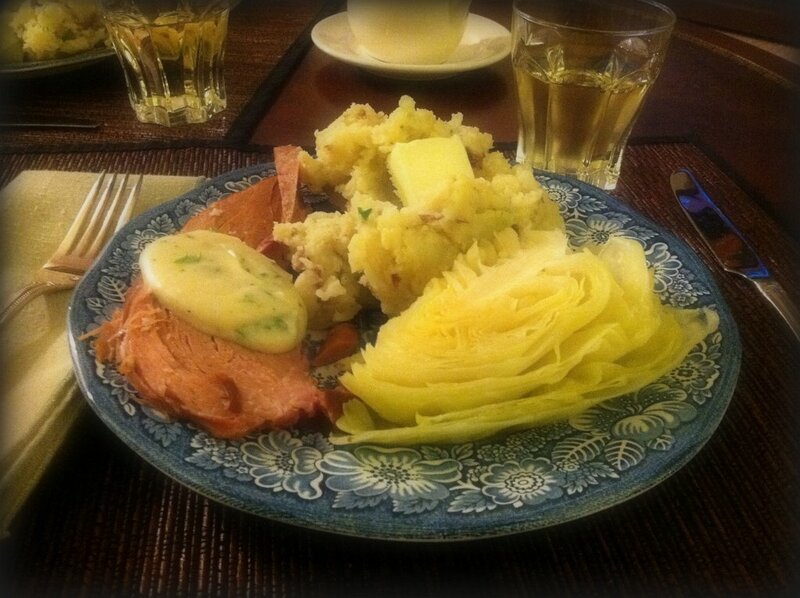 The photo above looks like a lot of food, but it's really not much ham; it's mostly potatoes and cabbage, so it's filling and cheap at the same time. There's nothing particularly difficult about this meal. It merely requires some planning. The ham has to be soaked for eight hours (it removes a good amount of the salt, so the final dish isn't unpleasantly salty, but believe me, it's still salty enough) and has to be cooked for 25 minutes per pound. The smallest bone-in ham I could find was 8 1/2 pounds, so the cooking took a little over 3 1/2 hours. The potatoes can be boiled well in advance, but the final cooking in milk needs to be done just before they're served. Also, it was very useful to have another pair of hands to slice the ham while I finished mixing the parsley sauce, although I could have managed by myself if I had needed to! I found that warming our plates in our oven at its lowest heat helped--the cabbage has to come out of the stock before the ham is sliced and I didn't want it (or the potatoes) to get cold. I just put them on the plates and put everything back in the oven. It's a real meal-saver if you haven't gotten everything timed perfectly! The first recipe is for the ham, cabbage and parsley sauce, as well as the ham stock which you can use in other dishes--stay tuned for my Split Pea Soup recipe. The second recipe is for Champ, or Irish Mashed Potatoes. What better to go with an Irish supper than a movie filmed in Ireland? I've briefly talked about Wings of the Morning before, but it's just such a perfect companion for Boiled Ham and Champ. 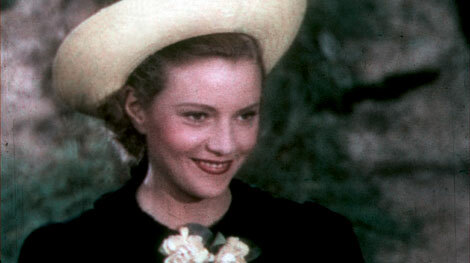 French actress Annabella plays two roles in the film--that of Marie, a gypsy, who falls in love with an Irish lord (Leslie Banks), and Marie's granddaughter, Maria, duchess of Leyva, who returns to Ireland a fugitive from the Spanish Civil War. 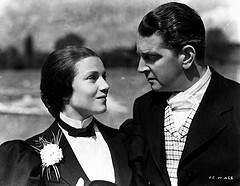 Maria also happened to dress in men's clothes to get out of Spain unnoticed, so when she meets horsetrainer Kerry Gilfallen (Henry Fonda), Kerry thinks Maria is a rather aggravating gypsy boy. Like I said in my previous post, it's not the most unpredictable bit of film seeing as it's a romantic comedy, but Annabella and Henry Fonda work well together and the technicolor Irish scenery is magnificent. Wings of the Morning is the name of a racehorse, so you'll also get to see 1937 Epsom Downs (and London!) in color, as well. It's quite a treat. I harvested a glorious head of cabbage from my garden last week and my Irish husband insisted we have this exact meal you've made! He grew up in Ireland, and loves the cabbage, potato, ham combo. Mmmmm...a perfect plate of comfort food! Looks great...especially the cabbage. mmmm looks like the best comfort food ever. You are incredible! We visited Ireland for my brother's wedding 6 years ago and fell in love with the country. One of my favorite dishes was (and still is) champs. Just got some potatoes in our CSA box, so I know what I'm making tomorrow. Have a lovely weekend! I really appreciate your food and movie tie-ins, keep them coming! This looks incredibly filling! Delicious. Champ sounds delicious--I wonder why it is called champ? Week-in-Review and more "Flea Market Finds"
Week-in-Review and "Flea Market Finds"